It was warm and sunny today...a first for "spring" in Michigan. So I loaded the dog in the car and headed south of Battle Creek looking for a sunny spot to do some sketching. I found this interesting old Grange hall about 6 miles south of where I live. The owner wandered over while I was working and I found out from him the old hall was built around 1900. Neat place and boy was it nice to be outside again! The warm browns of the railing and the hint of brown in the stone foundation connect the eye across the clapboard white & blue shadows. The light is spring light! Ah, isn't it wonderful to feel that warmth again!!! what hat a nice sketch and reward after finding a great object to sketch. 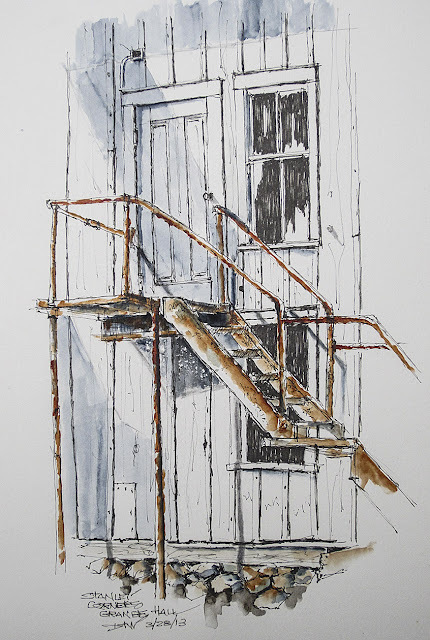 4th Annual Urban Sketching Symposium! March Scavenger Hunt--signs of spring!